Hide 53 comments... Click to show. Hey Axel, I am hearing several problems. The Offer problem should be handled by the offer company, you can contact them through the offer wall. The UGC problem is something more complicated, you have to contact UGC for the problem of used cards, send a email to them, click here to go to their contact page. They will trace the account which the code is registered on and then they will block it so you can get your code back. Yours sincerely, Yoshy. wb, i doin well, wbu? I want to know what's wrong ? good luck at weekly ! Spamming screen shots won't help win the weekly leaderboard. Make sure most of your FanCoins come from guides/tips. Please note that 60% of your FanCoins must come from GUIDES OR TIPS. Screen Shots do not count in the 60%. If not, you will be DQ'ed from the Weekly Leaderboard and you will NOT win. Congratulations on weekly leader board keep going. Good luck in the Weekly! r u doing the weekly this week? Hey, it doesn't matter if others are participating in the weekly. Just do your best and give it a try! Congrats on 2nd Place in Weekly ! I have problem at my screen shots i want help from any one because my screen shots not jpg . How i can win in weekly leader i have read the rules but i want to know the range of fan coins at all users here. To know more on fancoins and fanbucks Click here, start earning today!! Hello Axel! Have fun on FanUp! Any one answer me ? 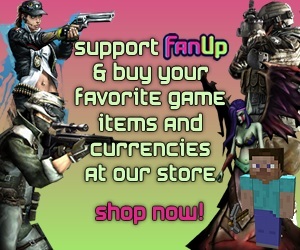 And what's fancoins ,Fanbucks and how i can buy things in my game ? Hey what's this wonderful site ?